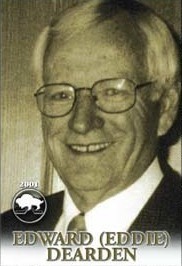 Born in Winnipeg, Eddie Dearden began a long sportswriting career in the early 1950's with the Winnipeg Tribune. He covered junior hockey at the Amphitheatre and Olympic rinks during his career. Dearden also covered the professional ranks starting in 1974 with the WHA Winnipeg Jets. Dearden was the colorman for Jets' broadcasts on radio with Ken "Friar" Nicholson and was a leading sportswriter on golf in this province. Ed Dearden was also named to the Manitoba Sportswriters and Sportscasters Media Roll of Honour.